I quit Diet Coke three days ago. To quote my favorite line from Persuasion, "I feel like death". The unpacking is at a stand still but I think things are looking up. You see, my friend Jennifer sent me a surprise package with this adorable onesie nestled inside. I love that the puppy on it looks like our sweet Bono Baby. Her thoughtfulness inspired me to unpack the goodies from my hope chest. I've been collecting goodies for a baby for years. We weren't necessarily planning on having children but I always figured we could give the pretties away if it didn't happen. Sometimes it is hard not to buy baby clothes. 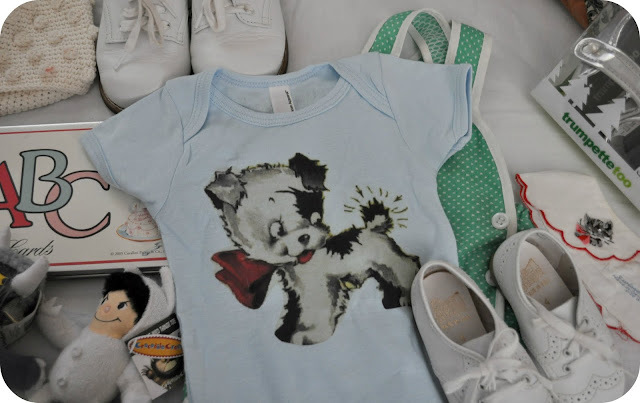 SO cute...your baby is going to be so chic:) love it. Phoebe bought girl clothes - even though she had two boys - but she did get her girl. It is hard to resist baby things - they are inherently cute. so cute! i love the onesie! I think it's wonderful that you've gotten things already for baby...even from years before. You sound like me! You have some adorable things already, I can see :) How fun! Hey love bug - are you going to find out what you are having? I know how hard it is not to buy things....like me, right now, waiting to see if you are having a boy or a girl!!! good luck with the diet coke! i used to drink 8 cans a day and it was horrible giving it up! a few months after i quit i decided to let myself have one as a special treat and it tasted terrible! i have a little secret hope chest too with vintage baby clothes and books. i didn't even admit i was saving those things for a long time because i said i would never have children. but yes, baby clothes are so hard to resist! I haven't drunk coke for three or more years. It is good to give up this drink, once you taste after a long while not drinking it, it tastes quite disgusting. what a precious onsie and sooo baby kitty/dan! <3 i love your hope chest and that you started your collection way before your blessing. p.s. when i become a momma-to-be like you-- i think that quote will sum up how i feel about quitting coffee. oh my, good luck with the diet coke, we drink fr too much of t in our house!